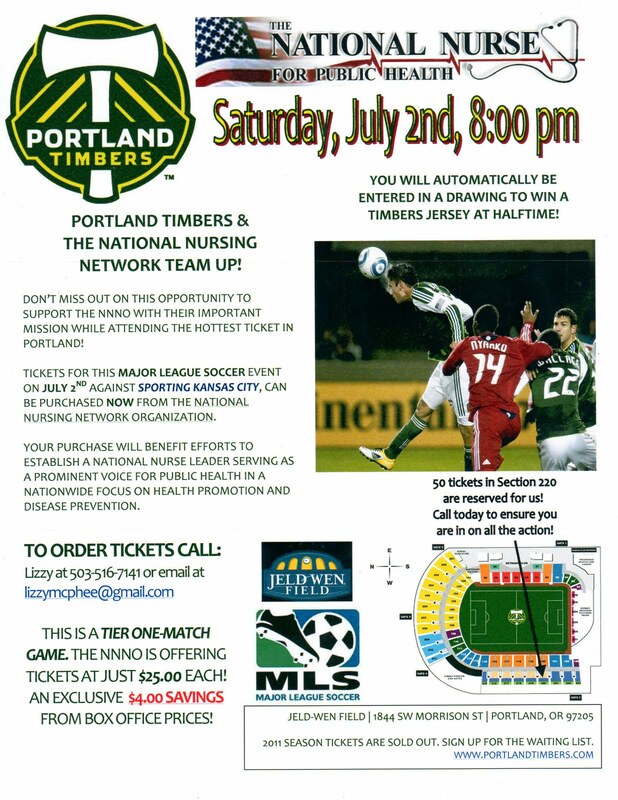 Portland’s Major League Soccer team, The Timbers, are teaming up with the National Nursing Network Organization for the Saturday night, July 2nd game against Sporting Kansas City! The Portland Timbers have generously donated a section of 75 seats and are contributing $10.00 of each ticket sale to the NNNO to support our important campaign. Timbers games are one of the hottest tickets in Portland right now and each soccer game is typically sold out! As a matter of fact those who want Season Ticket packages are currently on a wait list! One lucky attendee in our section will win a Timbers jersey to be drawn at halftime. There are still tickets available to purchase for just $25.00 each; that is a $4.00 discount off of the box office for this Tier One event! Thanks to Keith Carlson BSN, RN for writing an informative and persuasive article on HR 1119 The National Nurse Act of 2011. Keith writes: "The establishment of the position of the National Nurse for Public Health would set a new standard for a more accurate and realistic recognition of nursing's importance to health and health care in the United States. If the federal government enthusiastically and publicly embraced nursing, making its crucial contributions crystal clear, perhaps the public, the media and the private sector would all then have a greater understanding of, and appreciation for, the multitudinous ways in which nursing positively impacts the health of millions of Americans. Most importantly, however, the establishment of this position would certainly bring an important voice even more strongly to the ongoing conversation about health and health care in America. A National Nurse for Public Health could, in effect, deliver a unified message of preventive health at a time when millions of Americans---including millions of children---live without health insurance or access to regular primary care. At a time of crisis and uncertainty vis-a-vis the health of the country, the National Nurse could very well be a welcome, stabilizing and empowering voice of reason and prevention." The National Nursing Network Organization congratulates Representative Anthony Weiner (NY-9) and Jemma Marie-Hanson RN who were honored for their outstanding accomplishments during the CBID 42nd Anniversary Dinner. Representative Weiner, the original sponsor of HR 1119 The National Nurse Act of 2011, grew up in Brooklyn, and now lives in Queens. The son of a public school teacher, and the product of our public schools, he graduated from Brooklyn Technical High School in 1981 and SUNY Plattsburgh in 1985. After college, he went to work for then—Congressman Charles Schumer—and, after more than six years working for the Congressman, he was elected to the City Council. When Congressman Schumer ran for Senate, Weiner ran to replace him in the district that included Brooklyn and Queens and was elected to Congress in 1998. He was immediately appointed to the powerful Judiciary Committee and was elected “Whip” of his class. Representative Weiner currently sits on the Energy and Commerce Committee, which has the largest jurisdiction in the U.S. House, overseeing telecommunications, public health, air quality and environmental protection, the nation’s energy policy, and interstate and foreign commerce. The CBID paid special tribute to Representative Weiner for his passionate fight for quality, affordable healthcare for all. Jemma began her career as a Registered nurse in 1983. Throughout her career, Jemma has been an outspoken advocate and teacher for parents, children and infants as well as a strong advocate for her fellow professionals and for all patients. In 2006, Jemma was nominated through the State Assembly for appointment to the Board of Directors of Nassau Medical Center- Nassau Health Care Corporation in East Meadow, L.I., related to her activism in Long Island. She was appointed in 2007 by Assembly Speaker Silver and is the board chair for the Meadowbrook Medical Education and Research Foundation which assigns grants to specialties in the hospital. She also serves on the Medical and Professional Affairs Committee, A. Holly Paterson Extended Care Committee, and Community Health Center Committee. Thank you to both these outstanding individuals for their service and advocacy to improve the health of our nation. According to basketball coach Pat Riley, “You’re either in or you’re out. There’s no such thing as life in between.” The National Nurse Campaign is people powered with many nurses and key stakeholders who are willing to become involved because they too recognize the potential a National Nurse for Public Health has for improving the health of our nation. Since the introduction of HR 1119 The National Nurse Act of 2011, the National Nursing Network Organization (NNNO) has heard from dozens of enthusiastic supporters who are eager to participate and lend a hand. Many sent money, several emailed and called their US Representative’s office to urge them to sign on to this bill, some are seeking the endorsement of organizations they belong to, one presented the bill when talking with nursing students about healthcare reform in the 21st century, and one is using this bill as an experiential exercise in an upcoming national conference! Tara Candela JD, RN and Melissa Fox MSN, RN joined members of the NNNO Board of Directors as they met with staffers from the offices of 34 US Representatives. On several occasions, staff members recognized the names of constituents whose certificate was on the front of the packets of information that were presented to them. The staff stated these same individuals contacted them personally and because of this, they were closely following this bill. Staffers took notes, asked thorough questions, and we appreciated the time they spent on this legislation. Almost all of them had a family member or a friend who is a nurse, and they understood the important role nurses fulfill in healthcare and especially in health promotion and illness prevention. Personal visits and face-to-face encounters are so important to moving legislators to support this bill. We want to thank our team and supporters who take the time to join us in these trips, and thank those who financially contribute to assure their continuation. Every American Needs a Nurse! Washington D.C.--Congressman Anthony Weiner (NY-9), on behalf of nurses across the country including AFT-Oregon members and Portland Community College (Oregon) nurse educators Teri Mills and Alisa Schneider, introduced HR 1119 into Congress to establish a National Nurse for Public Health on March 16, 2011. The National Nurse Act of 2011 will designate the existing position of the Chief Nurse Officer of the US Public Health Service to serve as the National Nurse for Public Health. This nurse will continue to work along side the Surgeon General and focus on the priorities of health promotion, disease prevention, improving health literacy, and decreasing health disparities. Mills, who serves as President of the National Nursing Network Organization (NNNO) introduced the concept for a National Nurse in an op/ed, America's Nurse, published in The New York Times (May 20, 2005), and reprinted later that month in The Oregonian. "Agreement abounds on the nation's need for more emphasis on prevention in our quest for social justice and improved health outcomes, and the concept of having a publicly recognized nurse leader for prevention is the basis for the movement to create a National Nurse for Public Health," said Mills. "Members of Congress agree and already ten US Representatives have agreed to co-sponsor this legislation." A January, 2010 Gallup Poll, conducted by the Robert Wood Johnson Foundation revealed that 86 percent of those surveyed stated they would like to see nurses have more influence in promoting wellness and expanding preventive care. According to the Institute of Medicine and Robert Wood Johnson Foundation report, The Future of Nursing : Leading Change, Advancing Health, more nurse leaders are needed throughout healthcare. “The National Nurse Act of 2011 provides an innovative, pragmatic, and cost effective solution and one that augments many prevention components in the Patient Affordability and Protection Act of 2010,” says Mills. Schneider, Vice President of the NNNO said the National Nurse could be instrumental in the fight against obesity. "Americans across the country and of all ages are struggling with obesity and its complications. With the cost of obesity projected at $300 billion per year, prevention must continue as a priority for this country. 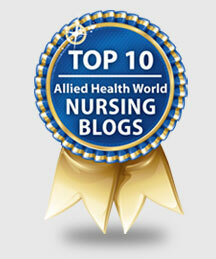 A National Nurse for Public Health would add an important voice in this discussion."